Increased fuel efficiency is theoretically one of the great promises that hydrofoiling holds, and one of SEAir’s more significant claims. In rougher conditions, although the hull would stay more immersed, the notion is that the foils provide a damping mechanism and produce a smoother ride. Once up and foiling, the floating sensation is divine. Ask the owners of planing boats what two characteristics of their speedy craft they would most like to improve upon and you will receive almost universal agreement. They would all like their fuel consumption to drop, and they would like to be bumped around far less in choppy conditions. And at heart, it is these two benefits that French company SEAir are hoping to bring to the party. That, and the notion that foiling can be safe and simple and effortless, not the preserve of super-skilled America’s Cup Olympians such as Ben Ainslie, or athletic yachties who bench-press 200kg before breakfast. The outwardly straightforward means to achieve this end – lifting a boat out of the water on hydrofoils so it can glide above the drag- and bump-inducing waves – has been around for over a century. There’s a grainy black-and-white picture taken around 1910 that shows an Italian inventor called Enrico Forlanini foiling above the surface of Lake Maggiore in a slender 20-footer. Later on, the Soviets and the Greeks developed a fondness for much larger hydrofoil craft in the form of passenger vessels. And Boeing Marine Systems created a 48-knot hydrofoil warship exceeding 250 tonnes and 40 metres as far back as the 1980s. So what took the pleasure boat market so long? Five factors in all: cost, competition, vulnerability, conservatism and technology. Developing a successful hydrofoil system is an expensive and time-consuming process, and the sort of commercial organisations that could afford to offset the development costs against long-term fuel savings often found that the competition, in the form of long, slender, powerful CATs, was frequently as efficient and far less complex. Unless a craft sports centre line T-foils, which are not really a workable proposition for leisure motor boats, the protruding port and starboard foils are vulnerable. That still holds true even when they’re retracted, because no hydrofoil system we’ve seen to date retracts completely inside the hull. The final impediment is that our industry is understandably conservative – few builders are prepared to take the risk of going out on a limb to develop something revolutionary. Suppose it doesn’t work! As is so often the case, technology is the thing that has changed the game. The 2013 America’s Cup spawned not just a huge surge of interest in foiling craft, but also a ‘leaps-and-bounds’ understanding of how they work best. The more real-world feedback they have from events such as these, the more accurate crucial computer programs such as Computational Fluid Dynamics (CFD) become as time goes by. And although carbon fibre has been around for a long time, manufacturing foils using CAD CAM (computer-aided design and computer-aided manufacture) is now a real-world proposition, not the preserve of America’s Cup budgets. SEAir’s foils weigh just 17kg, and they’re manufactured with a five-axis robot that lays the carbon epoxy pre-preg fibres with perfect accuracy directly into a precision mould. This process is so precise that the designer can predict exactly how they will deflect under load. SEAir’s foils are things of beauty – if you have an ounce of engineering passion in you, you would probably find yourself drooling in their presence. SEAir are not boatbuilders, so they have partnered with giant French boatbuilders Zodiac to develop their first creation: the hydrofoiling Zodiac Pro 5.5m that we tested on the Seine in March this year. The two forward hydrofoils are housed in simple cases that allow the foils to extend or retract, and a straightforward manual mechanism also allows the rake of the foil to be adjusted when the boat is at rest. This rake control changes the angle of attack of the horizontal part of the foil to the water flow, broadly comparable to the bow-up trim of a boat that alters the angle of attack of the underside of the hull. The rear foil comprises an ingenious fabrication that attaches to the lower part of the outboard motor’s drive leg and is coincident with the centre of the propeller. This greatly simplifies what might otherwise be a convoluted trimming process, by combining the trim of the foil with the trim of the outboard engine, and it’s controlled using the outboard’s own up-down trim button on the throttle. So far, so simples! However, there are plans to develop and offer an active system, akin to the active ride control that interceptor trim-system manufacturers such as Humphree offer. Depending on the level of functionality, in an ideal world the skipper may eventually be able to leave everything to the digital brain, including changing the trim to suit different sea states. Interestingly, the new R35 that Princess are developing will have an active system, albeit these hydrofoils are not designed to lift the R35 completely clear of the water, but instead to reduce the wetted surface and consequently the boat’s drag. SEAir also have a 7.0m Zodiac Pro prototype under development, an all-electric boat in the pipeline for the end of this year, and there’s an 8.5m scheduled for 2019. About a dozen other journalists were about to descend on sunny Paris to test SEAir’s boat, but we arrived early and were rewarded with our own dedicated test slot, first thing in the morning. I stepped on board with Benoît Lequin, head of production at SEAir, and a man with eight transatlantic crossings to his name. Benoît quickly lowered the foils, set their rake to zero, adjusted the trim of the outboard to +5 degrees, and we were off. Low-speed handling feels completely normal – if anything, a fraction more resolute than I’d expected for such a small RIB, presumably a consequence of the dampening effect of the foils gripping the water. We climbed slowly through the rev range, and the bow began to lift. It all came together at about 15 knots and above, when the boat lifted clear of the water and began to foil properly. Surprise number one was that no effort or fiddly trimming was required to get me to this point. On a sailing foiler, it’s often necessary to actively trim the foils as the speed increases and the trim changes. Not so on this particular little RIB, however. If the very first stage proved difficult, for me the whole idea of foiling would fall flat, so I think this initial ease is hugely significant – and this on the basic manual system, not the more sophisticated active version that’s planned. Once up and foiling, the floating sensation is divine. Most of the time, our little boat glided serenely above the light chop that the Seine dished up on the day of our test. And although the disturbance on the surface of the Seine would not have troubled a small boat like the 5.5m Zodiac, there’s no doubt that it’s a far smoother ride on the foils, and unlike anything I’ve ever experienced. The other big difference between a normal planing boat and our SEAir foiler is that it corners almost completely flat. At times, depending on the wave pattern, it even heeled outwards a little in the turns. This is quite something to contemplate, because it is the inward heeling of a normal non-foiling planing boat that generally makes cornering more comfortable and ultimately safer too. With no leaning post for support, let alone a bucket seat, the absence of any support only served to highlight the issue, with our bodies forced towards the outside of the turn. In completely flat water, this was merely uncomfortable, but I found that a passing wake or unexpected chop could easily catch me off guard. We did discuss the notion of SEAir’s active system possibly being able to heel a boat inwards to produce a more comfortable neutral G-turn, but only time will tell whether this is feasible. The steering itself felt quite sensitive. That’s no surprise, though, because although the forward foils provide lateral grip, with no hull in the water and only the bottom end of the outboard’s drive leg providing any grip at the stern, the back end is far freer to slide outwards in the turns, increasing the rate of the turn. It’s not a problem, just something to be aware of. I found that I also needed to be mindful of the trim of the engine and the interlinked rear foil. With the trim set to +5 degrees, our little boat remained quite stable in flat water, but was also happy to drive through the chop or across the wakes of passing ferries. However, I found that a little extra trim could have a profound effect on the boat’s speed and its fuel consumption, markedly improving both, so the temptation was always to trim up (trimming the rear foil/outboard up raises the bow and effectively increases the rake of the forward foils). The flip side of this was that because the foils lie very close to the surface of the water, the boat became notably more sensitive to chop and small waves, and it wasn’t difficult to get it wrong, catch an errant wave and fall off the foils. SEAir admitted that the engine’s own manual trim system is too sensitive a mechanism, and are looking at ways to desensitise this. If they can achieve this, I feel it will improve their manual system considerably. Of course, an efficient active system should bypass this issue. SEAir are not claiming that a boat as small as a 5.5m Zodiac is capable of foiling serenely over the top of giant waves in any conditions. 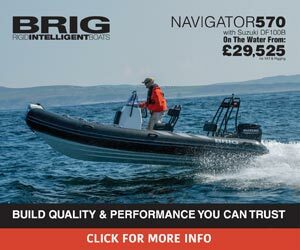 Although we clocked 32 knots flat out, this particular boat is optimised for 20 to 25 knots, and SEAir reckon that it will comfortably handle waves up to around half a metre. In rougher conditions, although the hull would stay more immersed, the notion is that the foils provide a damping mechanism and produce a smoother ride. Unfortunately, with no first-hand experience to draw on, we can’t confirm this, but video footage we’ve seen showing back-to-back testing of two Zodiac 5.5m craft in rough weather (one foiling, the other not) does seem to substantiate this idea unequivocally. Back in 1987 when he was still alive, Eric Tabarly, in my opinion France’s greatest ever sailor, allegedly said that ‘un jour, tous les bateaux voleront’ (one day, all boats will foil). And he knew a thing or two. Regardless of whether he was right or wrong, let’s remember that this is a prototype, and as such, there are inevitably unanswered questions. The extra-long shaft of the 115hp Yamaha fitted to our diddy 5.5m Pro is already as long as an outboard’s shaft can be, so perhaps the toughest question is how to get the power into the water on bigger craft, and how to mount the rear foil. If that is not going to be courtesy of a simple outboard-mounted foil, SEAir may have to develop a different aft foil control system. On Enata Marine’s amazing new 40-knot Foiler (https://foiler.com), the diesel-electric power is transmitted through pods integrated into the aft foil structures. But the 9.6m boat’s £1 million-plus price tag suggests that this sort of completely custom propulsion does not come cheap. SEAir’s aim is to bring foiling to the masses, in one way by offering ‘foiling packs’ as optional extras for otherwise conventional non-foiling boats, so expensive custom solutions seem unlikely. Increased fuel efficiency is theoretically one of the great promises that hydrofoiling holds, and one of SEAir’s more significant claims. So given that the company possesses foiling and non-foiling versions of their 5.5m Pro, it was disappointing that there was no thorough back-to-back test data available from SEAir, just a broad-brush claim of ‘in the order of 30%, and at some points more than 50%’. No doubt as the first of Zodiac’s production SEAir foilers becomes available, real data will start to emerge. As for the issue of foilers cornering flat, let’s not forget that they’re not the only craft to do this. There are plenty of much faster jet-RIB tenders out there with truly ferocious cornering abilities, but they do invariably have bucket seats. So perhaps it will become incumbent on the boatbuilders to provide the necessary supportive seating on their SEAir-equipped foiling boats to make that a safe and secure proposition. Having experienced the transformative effects of active ride trim systems (interceptors) on already good boats, it will be interesting to see whether SEAir’s planned active system can emulate their effectiveness in a different domain. Certainly, it has the potential to significantly enhance the benefits of the manual system. That said, I do think that a small boat designed from the ground up specifically to suit SEAir’s foiling technology, even in its basic manual form, could potentially be astonishingly effective. Even if Eric Tabarly’s prediction is a bit far-fetched, there’s no doubt that SEAir are on to something.